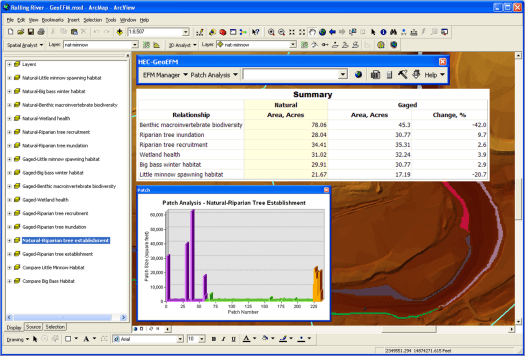 HEC-GeoEFM is an ArcMap extension developed to support spatial analyses commonly used during applications of the Ecosystem Functions Model (HEC-EFM). Use of HEC-GeoEFM requires a user license for ArcMap. Spatial Analyst and 3D Analyst extensions for ArcMap must also be installed and activated. HEC-GeoEFM provides three primary capabilities for users planning ecosystem restoration projects or water management scenarios: 1) management of spatial data sets, 2) computation and comparisons of habitat areas, and 3) assessment of habitat connectivity. Use of HEC-GeoEFM requires a solid understanding of HEC-EFM. 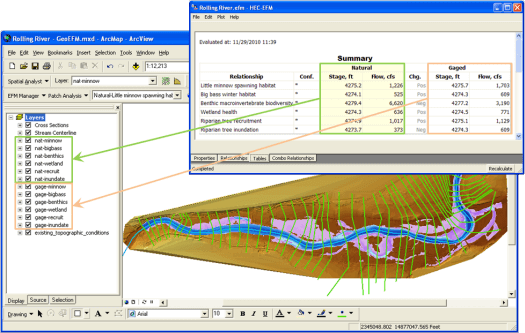 HEC-EFM is a planning tool that helps analyze ecosystem response to changes in the flow regime of a river or wetland. The process of applying HEC-EFM involves three basic phases: statistical analyses, river hydraulics modeling, and spatial analyses. Results from the statistical phase are input to external hydraulic models that generate layers of water depth, velocity, and inundation, which are then used in GIS to investigate spatial criteria and results for the flow regimes and relationships. HEC-GeoEFM is used in the third and final phase (spatial analyses) of the HEC-EFM process. HEC-GeoEFM was developed through a partnership between the Hydrologic Engineering Center (CEIWR-HEC) and the Environmental Systems Research Institute, Inc. (ESRI), in recognition of both the power of GIS and the importance of ecological considerations in water systems. HEC-GeoEFM has been certified for use in USACE Planning Studies by USACE Headquarters (HQ memo) as recommended by the National Ecosystem Planning Center of Expertise (PCX memo) as being sound in contemporary theory, computationally correct, and compliant with USACE policy.